MADRID, May 9, 2010 (AFP) - Barcelona must beat Valladolid at Camp Nou next weekend to retain the La Liga title on the final day of the season, however, manager Pep Guardiola warned of the threat posed by Valladolid under Javier Clemente who managed Guardiola in his time as Spain national coach. Barcelona won 3-2 at 10-man Sevilla on Saturday to move a step closer to the title holding a one-point lead over Real Madrid, 5-1 winners over Athletic Bilbao, going into the final weekend of the season. It is the first time the league has gone down to the final day of the season since 2007 when Real edged Barcelona courtesy of their superior head-to-head record although on this occasion Barcelona have the better head-to-head record and would win the league if the teams finished level on points. "The fans must not see themselves as champions because that's not the case and the team shouldn't think it and that is my job," said Guardiola. "This was a big step but we do not think we are champions." Valladolid need to beat Barcelona to be certain of staying in the top-flight and have only lost once in Clemente's seven games in charge. "We have the great fortune of having our destiny in our own hands but Valladolid are coming to us and they need to save themselves under Javi Clemente who I know because I had him as national coach," explained Guardiola. "Since Clemente arrived they have only lost one game to Atletico Madrid and they will be a defensive side looking for their chance. The danger is that everyone thinks it is done and that we are champions - which we aren't. "I just want us to play football and we still have to sweat and toil. We have 96 points and that is something to congratulate the team for. If we win the league it will be an epic triumph." Barcelona's 96 points is a league record but they still have to overcome Valladolid while Real are at Malaga, also fighting the drop, hoping their arch rivals slip up. Barcelona controlled the match against Sevilla going three goals up through Lionel Messi, Bojan Krkic and Pedro Rodriguez before two quick-fire goals from Frederic Kanoute and Luis Fabiano tested their nerves in the closing 20 minutes. "We played well in the first had and started the second well," said Guardiola. "There were those five minutes when they scored twice. We controlled it well at a time when doubts were creeping in." Barcelona held their nerve to take a vital three points in Sevilla and start as strong favourites to retain their title and leave Real Madrid empty-handed for the second successive season. With a best ever 32 goals Argentine Messi, 22, is set to win the Pichichi trophy for the league's top-scorer and drew praise from Guardiola who hailed his consistency. 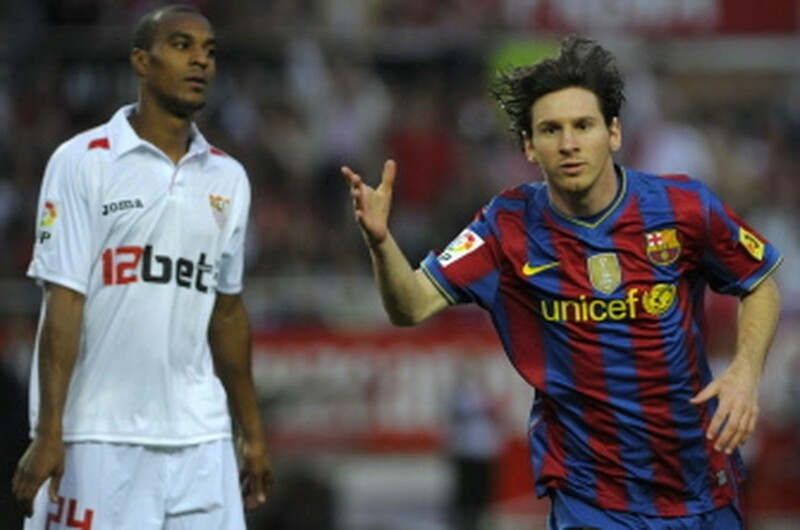 "In the last 20 months he (Messi) has been able to maintain an incredible level," add Guardiola. "He is not yet 23 and is already the tenth top goalscorer in the club's history."